We often associate having makapal hair with being unruly and buhaghag. But that couldn't be further from the truth! With the right hairstyle, we know you would never want to ditch your thick tresses. If you plan to wear it wavy, there's no need for a curling iron because you can do the same with a flat iron! Or if you're lazy AF that day, tie it up in a bun while it's half dry then when you remove it, you're left with "effortless" waves. To give your tresses movement, it's going to need a lot of layers. Just spritz on a little salt spray for added grit and you're good to go! Just remember to get a trim every few months to keep your hair healthy and shiny. It's a sleek, sharp, and one-dimensional cut that works because of its single length. No styling involved at all! It'll also make you feel like you're from the future since it's something that could work for a sci-fi flick! A thick and full fringe can make you look younger, so for all you thick-haired gals who want to freeze time, take note of this cut. Whether your natural hair is straight, wavy, or curly, this timeless 'do will always suit you. How else are you going to get a bun as thick as a donut? 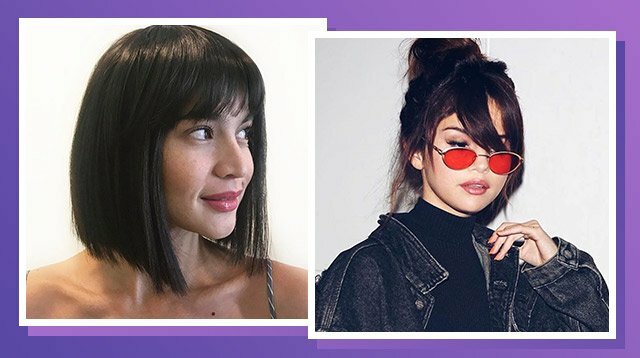 Plus, those pieces of hair that will fall out will create a lived-in look à la Selena! When you need to look polished but can't be bothered to style your tresses, a low ponytail with a few face-framing strands will do the trick!